Since the dawn of time, kids have been fascinated with dinosaurs. Although you can buy pricy dinosaur eggs for kids to excavate with a small chisel, it's just as easy to make them in about 30 to 40 minutes. This craft project is suitable for kids age 4 and up. The age and time guidelines listed above are estimates. This dinosaur egg craft can be modified to suit other ages and may take a little more time if you alter the craft to fit your needs. This recipe creates enough dough for a small group of children to make a few dinosaur eggs. Of course, the bigger the kids make their eggs, the less number of eggs you will get out of the dough. Ask your kids to go put on an old T-shirt, apron, or smock, so that they don't get their good clothes dirty. Measure and pour 2 cups of dirt from the yard, 2 cups of flour, 2 cups of sand, and 1 cup of salt in a large mixing bowl. Give these ingredients a little stir before continuing. Add the water to the mixing bowl slowly, working the dough with your hands until it is moldable. You don't want the dough to be too wet. Each child will need to select one miniature plastic dinosaur to live in the center of their egg. Place some of the dough around the plastic dinosaur until you can no longer see the dinosaur. Add enough dough to form the shape of an egg. 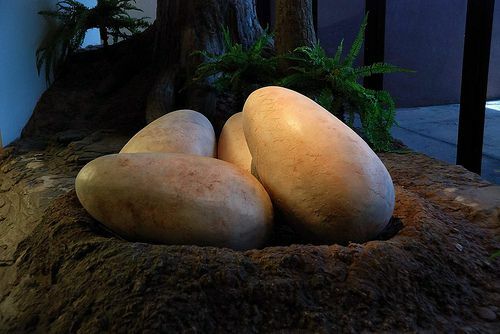 Set the dinosaur eggs aside for four days, so that they have time to completely dry out. Give your kids a few paints and a paintbrush and allow them to paint their dinosaur eggs. Set the eggs aside until the paint dries. Play with the dinosaur eggs until you are ready to excavate the dinosaur from the egg. Excavation can be accomplished with a spoon, small hammer, or by using a screwdriver as a chisel-type device. Younger children may need the assistance of a parent or older sibling for this step. Spray the eggs with vinegar to make the shell dissolve a bit more easily. Lay down newspaper sheets or old supermarket flyers over your workspace area to make clean-up a breeze. Instead of painting the dinosaur eggs after they dry, you can add a few drops of food coloring to the dough to make a colorful egg. Instead of drying the egg for four days, bake it in a low oven until it's dry. Substitute coffee grinds for the dirt if you'd rather not dig up your yard. Use this recipe to conceal a special toy or gift for one of your children. You don't have to mold it into the shape of an egg; it can just be a fun way to retrieve a birthday or special occasion gift.